Men’s skin is different from women’s. That’s why they need a facial cleansing brush designed especially for them. This is not to say of course that the cleansing systems we’ve featured here are not suitable for the male species. In fact, they are for both men and women unless otherwise specified. Admittedly though, not all the facial cleansers featured on this page are like the Alpha Fit. Meaning, their only difference with the women’s version is the color. For example, the Mia 1 for both men and women are basically the same feature-wise. The only difference is that the one marketed for men is gray. This sonic system from Clinique comes in an attractive, sleek design. The exterior is predominantly black. Only the button and the bristles are charcoal grey. With a lightweight and and compact, you can take this with you anywhere you want. The Alpha Fit has two settings to choose from. Setting 1, which lasts for 60 seconds, is a 20-20-20 second program for your daily cleansing regimen. However, if you have beard, or have just finished working out, you can choose Setting 2 for Power Cleansing. RELATED: Clarisonic Mia 2 vs Clinique Sonic System, Which One to Get? According to Clarisonic, this facial brush has been clinically proven to be effective. 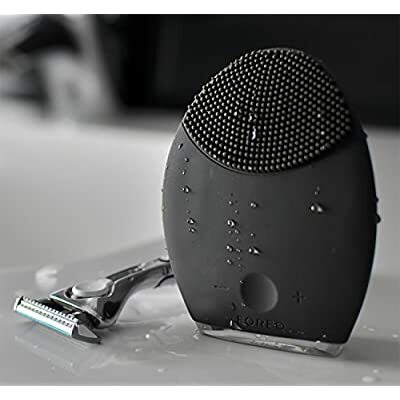 On their website, Clarisonic says that 90% of men experienced less shaving nicks and razor bumps after four weeks of using the Alpha Fit. 90% of men with beard noticed that they have a cleaner and softer beard after two weeks of using the Alpha Fit. If you don’t like having to replace brush heads from time to time, the Foreo Luna for Men is for you. With T-Sonic technology, this device delivers up to 8,000 pulsations per minute, which helps deep cleanse your skin to reveal a smoother and softer texture. Together in the box, this device comes with a pouch, a warranty card, a charger, and a user guide. And oh, it’s black! Also check out our product comparison between the Solo Mio and Foreo Luna here. Why get this cleansing system? As advertised, this helps prepare your skin for a smooth shaving experience. It opens follicles, reduces ingrown hair, and removes dirt particles that can lead to breakouts. As observed by several users, this Mia 1 for Men is no different than the women’s version feature-wise. The only difference is that this one comes in a gray exterior.